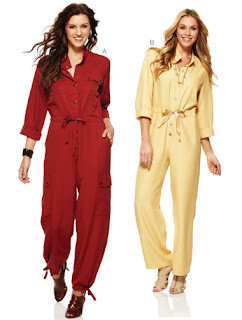 Sew-To-Fit by A.D. Lynn: Jumpsuits..a sign of the times, who's copying who? Jumpsuits..a sign of the times, who's copying who? I wasn't much of a fashionista when I made this 25 years ago. But, I tell you I was a pretty good sewist by anyone's standards. And I did know fashion, also by the looks of it, I also had a good handle on the moonwalk. Life was so much fun back then. I just know, from past experience, she will rock this jumpsuit. As comfortable for the tom-boy as it is stylish for the fashionista. This jumpsuit, suits all styles. Dress it up or down, and you have a tough little outfit to do anything in. I made mine back then, I think, out out a grey brushed cotton twill. But you have to remember, if you are old enough, that back then there wasn't much in the fabric department to choose from. So, I can't wait to see this made up in the silk crepe de chine she is hoping to find. I know I wouldn't wear this again, my rump roast is way to big for this type of look. Something, I just didn't notice back then. But, oh yeah, people didn't really worry so much about that, because just the fact that you sewed something yourself, brought on all the ooo's and awwww's. It was a part of life to sew for yourself. Now, it almost seems that you have to prove you can do better than the designers out there. (Thats another ranting blog..) Cause, I believe what people are so call copying from today's designers, they could just find in their mom's closets and just be-dazzle the stuff a little and accessorize and you have a "look". Not to step on anyone's toes, but if you are not copying Carolina Herrera and the likes of her, you are just remaking the same old stuff from back when mommy taught us how to sew. With that said, just make what you like, and trust, it has been made before. Nothing is new, and trends are what you make of them. Use the patterns provided by our lovely pattern designers as a springboard to do what YOU want and enjoy your creations as your own. Not so you can say I copied a designer original...cause you didn't. What you DID do is save all that rediculous money they try to charge for the garments. OooooK...sorry, I just had to get that out. No offense to any of my lovely friends in sewing blog land. Sew til later.. luv ya! Love the pics...I agree you must have been having great fun!!! I also agree that there is nothing new under the sun.... I love this jumpsuit! I hope to make it this fall as well. I only owned one jumpsuit "back in the day!" It was black silk, and I wore it until it, literally, fell apart!!! I, too, will be on the look out for some beautiful crepe de chine...whoo hoo!!! i agree that fashion circles around...i think with most of the items i create..i may have been too young to appreciate the style of them the first go round or am just becoming mature enough to appreciate the dresses, etc. of the 50's & 60's! and as a side note..i am a sewer, that loves clothes...but not necessarily into high fashion or designer names...so with that said..i am about to go google Carolina Herrera..! thanks for bring some "real" to blog land !! I was a teenager in the 80s and made myself a fabulous yellow cotton jumpsuit from a Burda pattern. Ouch! The topstitching was nicely done though :-) Pretty sure I won't be wearing that look this time around.